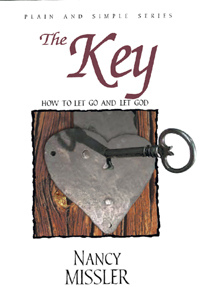 This is our most popular Plain and Simple book as it explains what is “the key” to our Christian walk . Most of us, as believers, understand that we have God’s Love in our hearts. But how many of us, in all honesty, really experience that Love of God in our everyday lives – in our marriages, in our relationships, and in our workplaces? We all talk about experiencing His Love, we write about it, and we sing about it, but how many of us are really living an abundant, love-filled life? The key to actually experiencing that Love in our lives is understanding how to yield ourselves, moment by moment, over to the Lord, so that His Love can flow out from our hearts. This is what The Key is all about—the practical application of giving things to God so that we can share His Love. What are the daily steps to letting go of ourselves and letting God take over? How do we give our problems to the Lord and leave them there? How Do We GIve Thngs to God? My sister-in-law intercepted a copy of The Key I was sending to my sister. She couldn’t put it down. She rang me to say that God had really blessed, healed and change her through the book. All her negative feelings were gone and she was experiencing amazing peace. Thank you Nancy! Learn more about The Key with these supporting materials. would like to purchase some books . i am in australia. can i purchase them from anywhere here? please let me know asap. Thank you for inquiring about our books! We hope this helps with your purchase!